This classic potato salad is the Best Ever Potato Salad! 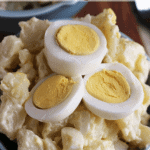 Tender potatoes and hard boiled eggs make this traditional potato salad the BEST basic potato salad recipe around! Peel and dice potatoes. Place in large stock pot and cover with water. Bring to rapid boil, turn down to medium heat and boil 5-7 minutes or until potatoes are tender. Drain potatoes and let cool. In a medium mixing bowl whisk whipping cream for 1 minute. Stir in Miracle Whip, mustard, sugar, salt, pepper and vinegar. Mix until combined. Pour mixture over cooled potatoes. Peel and dice three hard boiled eggs and add to potatoes. Mix until combined. Peel last three hard boiled eggs and slice and place on top of salad.